The Bow Shock of The Great Filter is buffeting us. Robin Hanson coined ‘The Great Filter’ in part to explain the discrepancies with the Drake Equation and the Fermi Paradox. It sounds like so much longhaired physics, and some of it is, but it is understandable. We just need to break it down. The Drake Equation is an attempt to predict or define the potential for extraterrestrial intelligent life. In a way, it can help determine the potential survivability of the human species. The Drake Equation has its shortcomings, like any speculative construction. 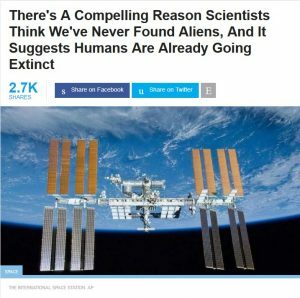 It gives rise to a primary criticism, the Fermi Paradox, which suggests given the lowest estimates one might use in the Drake Equation there should be a great many intelligent civilizations in our galaxy, much less the universe as a whole. So, where are they? This is where The Great Filter steps in. Robin Hanson suggests there is some unknown hurtle that prevents or restricts “dead matter” from becoming “everlasting, expanding life”. This barrier – The Great Filter – is some final step a civilization must surmount in order to survive long enough for their galactic presence to be known. We exist. We might argue, incorrectly or otherwise, we are a reasonably intelligent civilization. As such, the early portions of the Drake Equation can lead to lifeforms such as ourselves. Therefore, we must assume The Great Filter is buried inside the later parts of the Drake Equation – those variables after the rise of an intelligent civilization. The colloquial assumption is the Great Filter is some potential for civilizations to succumb to or prevent something like global thermonuclear war. However, I think we need to expand this view. Looking at the later variables in the Drake equation – planets with lifeforms capable of producing broadcast communication systems – we can draw some logical inferences. 1. Independent thought and discovery must exist inside of socially cooperative structures. 2. Some form of industrialization exists, along with all its associated pollutants. 3. Some form of rudimentary automation exists, and will continue to expand. 4. The development of weapons of mass destruction is achievable. Item 1 is indicated through the discovery of basic scientific principles, along with the talents to exploit them. Hive minds would have difficulty thinking outside of the box – discovery and exploitation of natural phenomena would be difficult. Likewise, building such scientific advancements would require cooperative efforts, indicating social structures. Where there is independent thought and social structures, there is the potential for unrest – warring. Item 2 has the potential to lead to climate or environmental changes on an extinction level. Item 3, while seemingly benign, will ultimately lead to some form of radical social unrest. Technological civilizations would ultimately face a rapid social paradigm shift, something akin to what is termed “The Singularity”. We are all familiar with the dystopian “Terminator” view of this type of technological development. It is not necessary for the technological leap to be self-supporting. It does not need to be the development of computer like Artificial Intelligent technologies. Simple automation capable of eliminating a means of support for the majority of the global population will force social change. Instead of “Terminator” think “Forbidden Planet”. At that point, the social structure, whatever it is, has to change and it has to change quickly. Can a civilization survive such an upheaval? All of these outcomes indicated by the ability to develop communication broadcast systems carry the potential of destroying an entire global civilization – conditions that would not exist if the civilization were not capable of developing that technology. We currently face all of these threats. Unfortunately, these threats come with feedback mechanisms built into them. As we attempt to avoid nuclear war, we develop new warring capabilities that are not nuclear but may be just as destructive, perhaps uncontrollable, such as chemical and viral attacks. Climate Change and Social structures rub against each other, either delaying the ability to address the issues, or causing rapid solutions that further aggravate them. The world seems crazy these days. All of the “old ways” are ending. Social structures, capitalism, communism, ownership, belief structures, et al. cannot survive in a world where every task can be performed by a machine, leaving people with little to do and no viable means to support themselves. We have the means of destroying the globe with the press of a few buttons, or the means of polluting it into extinction by doing what humans do best – procrastinate. We also possess an adherence to beliefs and social structures that make necessary change almost impossible. Within 100 years, technology will press the issue. The pressure is already on. The Singularity may arise, uncontrollable technology either eliminating or saving the human species. Regardless of the Singularity, elimination or salvation may be delivered by global social unrest. Likewise, climate and environmental changes already in motion may make attempts to persevere moot, or may force radical social and technological change. We are currently living in the bow shock of the Great Filter. This entry was posted in Weird Science and tagged Artificial Intelligence, Climate Change, Science. Bookmark the permalink.